A surprising thing about Victoria is that despite the plethora of beautiful vistas, few restaurants or pubs feature ocean views and outdoor patios are as scares as hens’ teeth. 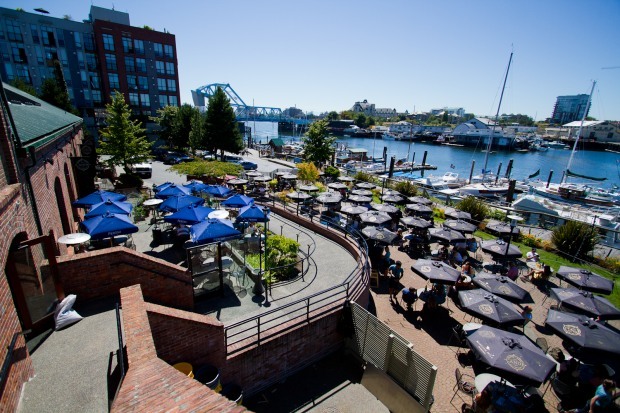 Canoe Brewpub is one of the few establishments to boast a spacious waterfront dining area right in the heart of downtown. Inside the restaurant, Canoe’s soaring timber frame and rustic brick architecture exude a modern, stylish vibe. Live music is featured Thursday, Friday and Saturday nights and free parking is available. 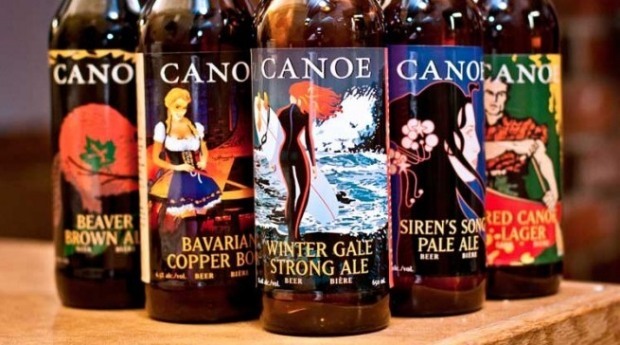 Canoe serves exceptional handcrafted beer and they have a diverse award winning wine list that will satisfy the most discerning oenophile. Our favourite summer tipple is the Pimm’s Cup, an unusual yet addictive concoction of cucumber, lemon, soda and ginger beer that is both cooling and thirst-quenching. We used to eat at Canoe quite a lot, but recently the menu has undergone a drastic change, and we haven’t been thrilled with the results. The food seems very formal for such a laid back space and it feels a little incongruous (and the flavors are underwhelming). That being said, Canoe is still a great watering hole. The house made beers are very good (try the Beaver Brown Ale) and the cocktails expertly made. The patio is sublime in the summer months and you can often get a table without much of a wait. If Canoe reverts back to their former menu (or a reasonable facsimile thereof) we will be sure to let you know. In the meantime, we’d suggest you grab a bite elsewhere first and head to Canoe for a cold one afterwards. There are few nicer places to quench one’s thirst and soak up the afternoon sun. We all need our vitamin D! P.S. To add even greater liquid delight to a beautiful summer evening catch a Victoria Harbour Ferry from the inner harbour to the Canoe marina. For more information on Victoria Harbour Ferries click here. Location: 450 Swift Street, Victoria. View in Google Maps.